Sometimes you have an event with a SPECIFIC color scheme. For my cousin’s wedding her colors were metallics and turquoise. I always request samples of the colors so I can match them as closely as I can. The silver and gold was easy to get for topping the cupcakes with, but bronze and turquoise was harder. SO I decided to make my own. Each topping for the wedding cupcakes was not only different colors, but different mediums too. We wanted people to be easily able to tell them apart! 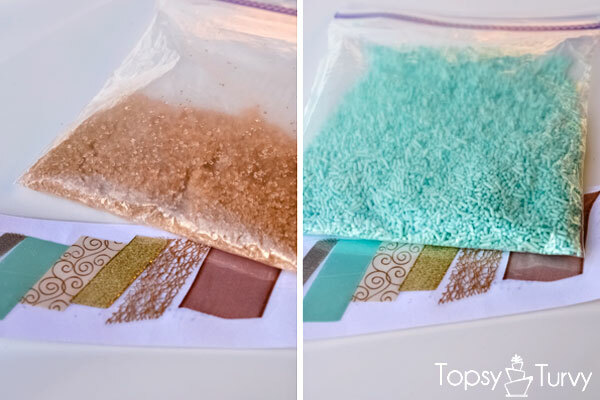 White non-perils, Silver dagrees, Gold foil stars… so we decided on Bronze sugar crystals and Turquoise sprinkles! 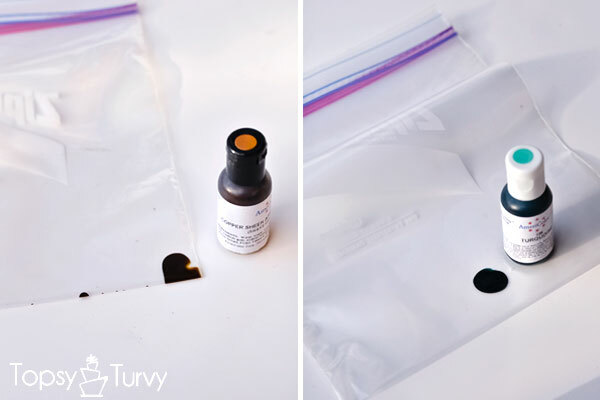 Start by putting your dye in a thick plastic bag. The Airbrush paint is much thinner and I ended up using MUCH more, but better to start small, you can always add more. With the gel I started small, and ended up not adding any at all! 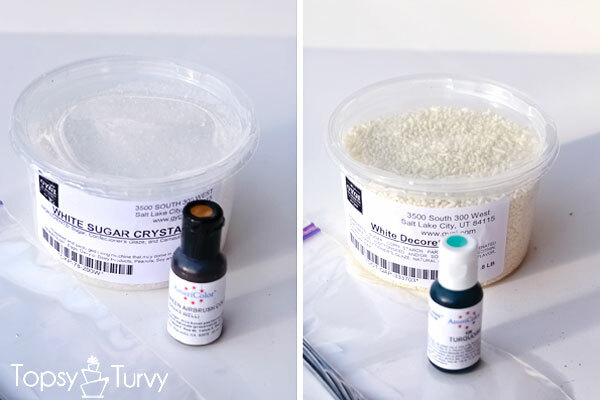 Add your crystals and sprinkles and MIX! 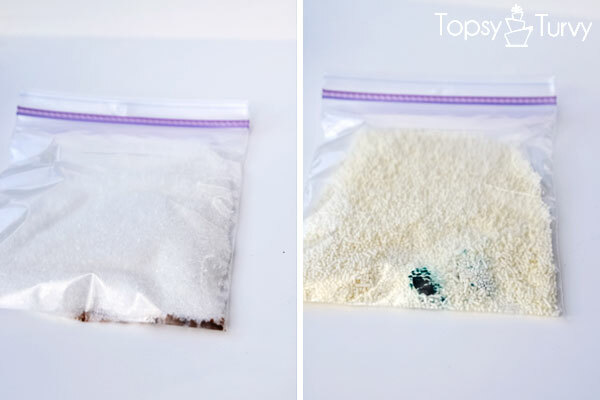 My kids loved this part, they shook the bag, massaged the gel in, etc… adding more coloring if you need it. you can see I got it really close to the samples she sent (the bronze is hard to see cause it’s a mesh ribbon – second from the right). they were perfect! 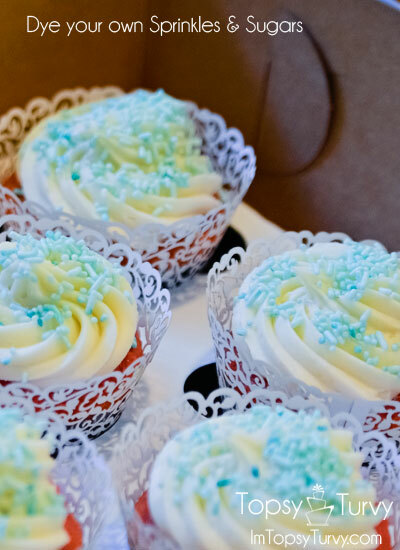 And I used the same turquoise to dye the vanilla frosting and the “blue” red velvet cupcakes so they all matched! I get mine at Gygi’s.